His name means fire of God. He presides over Tartarus or Hell. 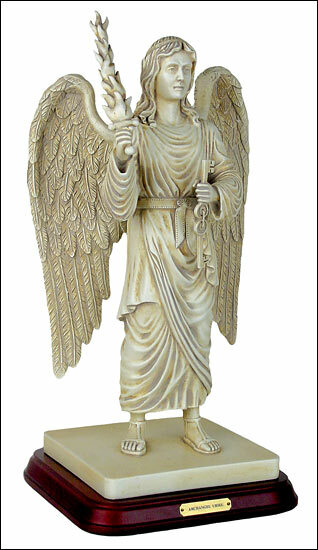 Being both a Seraphin and a Cherubim, he is identified as one of the Angels who helped bury Adam and Abel in Paradise: as the dark Angel who wrestled with Jacob at Peniel: as the destroyer of the Host of Sennacherib and as the messenger sent by God to warn Noah of the deluge. Often identified as the Cherub who stands at the gate of Eden with a fiery sword or as in Enoch I where he is the Angel who watches over thunder and terror. In the apocalypse, Uriel appears as the Angel of Repentance who is graphically depicted as being about as pitiless as any demon you would not want to meet in hell. Here he is shown holding his fiery sword of justice in one hand and the keys to the gates of Hades in the other hand.